Brian took on the Coffee Kahlua and wrote the most detailed, thoughtful post. Not only did he try it a couple of ways, but he posted (beautiful) photos of every step. If you don’t know his blog, check it out for sure. Nicole made the Raspberry sorbet as well as Cookies ice cream to satisfy the hubby who’s not a sorbet fan. She had a metric moment, which has come up as a bit of a theme, but she figured out the conversions. She loved the raspberry and he loved the cookies (even though she added too much vanilla bean, so everybody was happy. It seems even the dog got a lick! Jennifer tried the Cinnamon ice cream. She comments on the metric measures used, but figured out that converting it before writing a shopping list could keep a Mom from crying in the store! She left the cinnamon stick in longer and liked the result. She would have liked cinnamon specks in the ice cream. 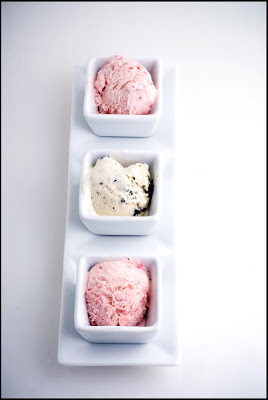 Dave made the Strawberry and Sage ice cream. He used frozen strawberries, cut down on the sugar and added more sage. Helpful comments. 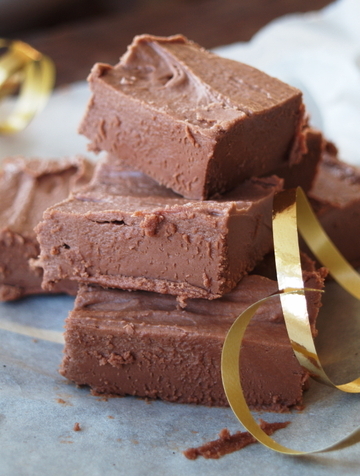 Laura made two recipes – fudge and brownies. When words like “salvation” are mentioned, one thinks it was a success! Tricia took on Cookies ice cream and wrote it up, pointing out the custard-heating process could use more clarification. She used Newman-Os, which is a healthier but still tasty option! The final product disappeared in record time! Rachel made the Honey Cardamom. She ended up with a kitchen redolent of cardamom and a tasty dessert. She didn’t use an ice cream maker, and the mix separated slightly while it was freezing. Food Rockz Man made the Honey Cardamom. He pointed out that I should clarify whether to use pre-ground or freshly-ground cardamom since the latter is stronger (he grinds his in a coffee grinder). He used a double boiler to avoid over-heating the custard, which I found a good idea if you’re nervous about temperature. Lisa made the Cardamom and Cinnamon ice creams. She mentioned that the custard was thinner than normal custards, which is a good point, and I should make sure to add to the book that this is o.k. She substituted grown cinnamon for the cinnamon stick with no ill effects. Finally, she didn’t have an ice cream machine, and it’s great to know these recipes worked without one. Jen took on the Cinnamon ice cream and added the Hot Fudge sauce to placate her chocoholic Mr. B. Both were a success, and it seems she had to restrain him from chugging the lot. It’s a fun post! Homebase and Middleson got cooking with no fewer than three recipes! The Extreme Cocoa went down well, and although they had no problems eating the chocolate crust, they suggested it should be less thick for better spreading. They had some trouble with the strawberry and sage – the coulis was too thin and separated. They also suggested metric conversions. A very detailed and helpful post. Sarah made the Cinnamon ice cream AND an apple crumble. What a great pairing. 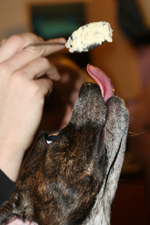 She liked the fluffiness from whipping the cream, which seems to be a common theme. Not a bad idea, and it seems to have worked quite well. Wendi made the Strawberry Sage and Cookies. She suggested more sage and more cookies. I like that kind of thinking! Deborah made the Cookies ice cream after a difficult search for Oreos. 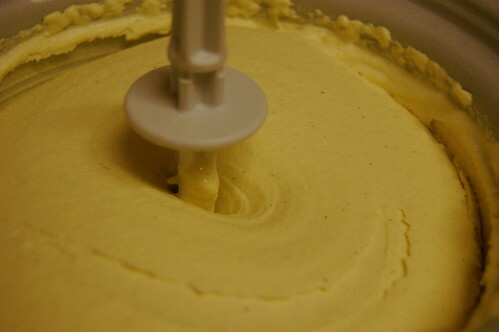 The ice cream making went smoothly and she gave the recipe top ratings. She also offers a great alternative to the traditional Irish breakfast. No… it’s not ice cream! The amazing Frederique made two recipes – Coconut and Rum and Extreme Cocoa. Her Mom chipped in with Manuka Honey and Orange Blossom, and even followed my recipe, which, it seems is a great honour. She found her’s too sweet, with not enough orange blossom. Frederique also found the Extreme Cocoa too sweet, but loved it when she cut down the sugar. The Coconut worked well. Lots of interesting comments and stunning photos. I’ve been reading your blog for several months now and thoroughly enjoy it! Thanks so much for posting your recipes and experiences with the shops. I share the love of ice cream. 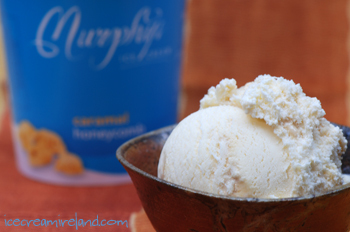 I made the cinnamon ice cream with many accolades from friends and family. We all love it. It combines all the best of autumn: spice, cream, dessert. It’s certainly addicting, for sure. 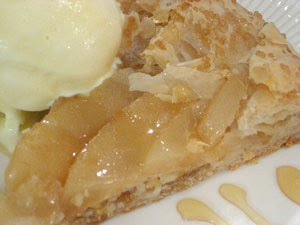 We tried it with apple pie, as suggested–fantastic. We tried it with a tiny swirl of chocolate (tasted like Mexican hot chocolate…. chilled!). We tried it with spice cake, which matched the flavors, and provided texture and temperature for contrast. In the end, three of us decided it was the best ice cream we had ever had, and my friends now call me the Ice Cream Queen. All thanks to you! Your sugar measurement is in ml, I presume you meant grams. Also 3/4 cup of coconut weighed 60g on my scales. The ice cream after 35 min in my ice cream maker was still very soupy, I gave it a couple of stirs while setting in the freezer and ice crystal formation doesn’t seem to be a problem. I guess that is the alcohol content (both making freezing slower but helping prevent ice crystals). My only other comment is a small but picky one. The ingredient list doesn’t follow in the order that you need ingredients. Making it easy for someone like me to forget something! Made the brown bread ice cream. It was a first for us. There is no such thing as brown bread ice-cream in Holland. We loved it, especially with the whisky and chocolate sauce. Your receipt was easy to follow, I tried following it to the letter. I used a gaggia gelateria (self freezing) machine. Amounts were correct. Temperature was a different thing. No way custard will thicken at 60’C. Tried it with a thermometer. Put the mixture in the fridge to cool and surely, it separated. Put it back in the pan and heated it to 76’C. It was nice and smooth and coated the back of my spoon. When I use my own method I simply ad a teaspoon of corn-flower when cooking the custard. It prevents it from curdling. Delia Smith I’m afraid, but it works. Bread in ice-cream was a nice addition. The flavour could have been a bit more outspoken though. The taste of the brown sugar was a bit overpowering. I did use a nice dark brown and course textured bread. Next time I will try roasting the crumbs first and/or reduce the amount of sugar. Thank you for your wonderful website and ideas. I have started writing up the round-up for the ice cream party, but it will take me a few days, and I’m really under pressure now to finish the book (due this weekend). Since I’m being slack, I’ll add anything else that comes in before I post the round up. So, if you still want to take part, see here. I can’t thank everyone who tested the recipes enough. There have been so many helpful suggestions! 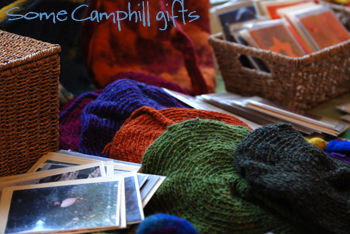 Today, the Dingle Camphill Community had an open day and craft’s fair. 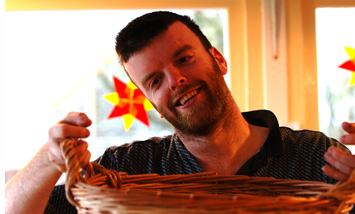 Camphill Communities are for people with special needs including autism, Down’s Syndrome, etc. It might be a little early for some to be thinking about Christmas gifts, but if you want something really special, you can buy all sorts of wonderful crafts made on the premises and of course the money goes to support the (non-profit) organisation. Basket making, weaving, etc. are used as therapy, and it’s brilliant to see the pride they have in their work. There are quite a few Camphill Communities around the country, and I can’t recommend paying a visit more strongly. It’s usually possible to just drop in, and it’s utterly heart-warming. If you come home with a special gift, so much the better. 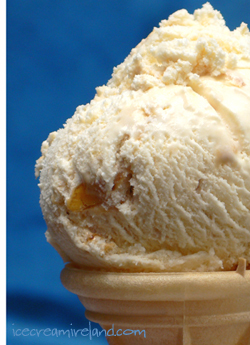 This is just the final reminder that there are just two days to go before I do a round-up of the Ice Cream Party! The idea of this is to help me test recipes for our upcoming cookbook. Anyone who wants to take part, see here, and get cooking! Thanks to everyone who has sent something in already! A couple of related news items have come to my attention. 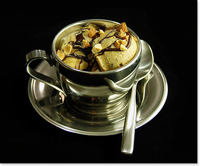 The first is that Serendipity 3, the New York eatery and creator of the $1,000 ice cream treat – their “Golden Opulence Sundae” set a Guinness World Record back when they introduced it some years ago – has gone a step further and released “Frrrozen Haute Chocolate” at $25,000. I guess for 25K, you get two extra “r’s”. You also get a blend of cocoas, 5 grams of 24 karat gold mixed in, and a topping of La Madeline au Truffe. It’s served in a goblet with a crown of gold and diamonds, with a golden spoon you can take home. Dingle beat the might of An Gaeltacht yesterday in the West Kerry Semi-Final Replay in a major upset: 8-7 in a close match. I love going to some of the local games, where you can see players that have become so famous for their county scrapping it out in front of a small crowd. Of course, you could just call it procrastination fromÂ writing the ice cream book! This is just a reminder that there is just over a week to go before I do a round-up of the Ice Cream Party, so start making ice cream! The idea of this is to help me test recipes for our upcoming cookbook. Anyone who wants to take part, see here. Thanks to everyone who has sent something in already!